Cyndere’s Midnight is the sequel to Auralia’s Colors. Auralia herself is gone, but to the people of House Abascar, who still deal with the fall of their city, her memory is very much alive. Led by Cal-Raven, they struggle to find peace as they build a temporary home in a vast network of caves. Their numbers swell as Rescue, Auralia’s firewalking friend, gathers up wandering survivors and brings them to the caves. At the same time Cyndere, the heiress of House Bel Amica, arrives in an outlying Bel Amican outpost, hoping for peace. She is haunted by her husband’s death at the hands of beastmen and ready to give up on her dream of taming the beastmen when she meets one who is somehow different and who begs for her help. Four beastmen prowl the Expanse, gathering prizes from the people they kill. The eldest, Mordafey, plots to earn enough Essence, the beastmen’s power-giving elixir, to become strong enough to kill the beastman chieftain and take his throne. He bullies his younger brothers into complicity and obedience, promising them Essence and power. Yet Jordam, one of twin middle brothers, knows more than essence; he knows the enchantment of Auralia’s colors. After being wounded while hunting, he comes across a well painted with the spell-binding colors. A Bel Amican woman find him there and offers him something better, purer than the addictive Essence, effectively beginning the weaving of the beastman’s life-thread with not only her own, but also those of the Abascar refugees. While I felt that the book was missing something without Auralia, I still loved it. The echoes of her legacy are still felt throughout the book, and her gifts draw characters together, making her very much a shadow presence within the story. Cyndere is not quite as much of a book that can be felt like Auralia is, but it certainly is not missing any of the mystery of the first instalment. I was again amazed by the depth of Overstreet’s characters, right down to their distinctive voices. The author skilfully uses specific words and sentence constructions so that each member of the cast stands out as a person in his or her own right. Even the most minor characters are rounded and complete with emotions and goals of their own. Overstreet also subtly wove reminders of and links to the first book throughout the narrative. I personally enjoyed being able to understand some things that the characters didn’t know based upon what I remembered from Auralia and felt like it brought a tangible continuity to the second book. On the negative side, I would not recommend this book for young teenagers, due to some fleeting adult content: discussion of nakedness/people seeing nakedness and marriage beds. 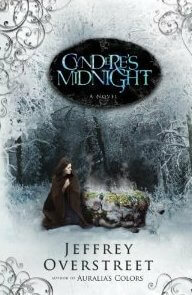 For those who loved Auralia’s Colors, Cyndere’s Midnight will be a treat. Lose yourself in the world of the Expanse again. Immerse yourself in a tale of grief, forgiveness, and hope against all odds. You won’t consider it time wasted. Next Post:Interview with Wayne Martindale Previous Post:Giveaway: Narnia Pack!